MAPS: Borrowdale, and the Bowder Stone location. We were lucky enough to be invited to a picnic in Zion Canyon yesterday. The lady who cooked the 'Ma Hall's' recipe beans in a Dutch Oven, which is a heavy cast iron pot with a handle to hang it over the fire or built in feet for standing on the coals, pointed out to us where the 5.8 magnitude 1992 Zion earthquake occurred: Amos 1:2 'And he said, The LORD will roar from Zion…'. The exposed water pipes may still be seen. A 5.6 magnitude earthquake in 1933 was responsible for a large landslide at the west entrance of Zion National Park. Both landslides continued to move for hours after the earthquake, probably because of water and clay deposits beneath the surface of the landslide area. The epicenters of these quakes are often a great distance from Zion, yet they can still exert dramatic effects. We had planned to make an odious comparison between the heights of rock faces in the English Lake District and the truly awesome rock faces in Zion Canyon. However, the Bean Lady mentioned a balanced rock that had fallen [CORRECTION: we have been informed that the balanced rock did NOT fall - this is under investigation, probably becoming a feature in its own right when the information is to hand] during the earthquake, and we were delighted when arriving home to discover that Tony Richards was featuring Lakeland's own balanced rock, known as the Bowder Stone! It is said that two people who shake hands through the small passageway that passes under the Bowder Stone will remain friends eternally. 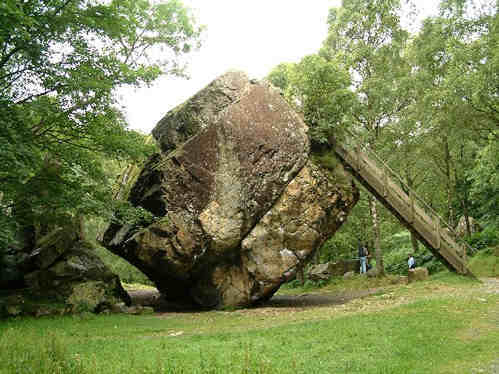 The invaluable VisitCumbria.com has more information on measurements of this glacial erratic, which stands on the opposite lake shore to the first NT (National Trust) property purchased at Brandlehow Wood, and was itself an early purchase by the NT. A photographer from the 19th century, Francis Frith, visited in 1860 (the image is incorrectly captioned) and again 1893. It is interesting that the mature woodlands in which the Bowder Stone now sits were not there one hundred years ago. Now honor has been served with this feature, so that tomorrow we can show you the grandeur of Zion without anyone feeling that Lakeland has been belittled or insulted. American actor (1967- ). A strange distinction, but we read that currently he is the only 'Friends' cast member who has not hosted 'Saturday Night Live'. He seems to live the ideal bachelor life: his girlfriend is stunningly beautiful; he owns a Pantera car; his hobbies are mountain biking and landscape photography. He shares his life with a dog called Lady. Sounds like his head is screwed on right… or nailed in his case, because he majored in carpentry. Sounds like fun to us. 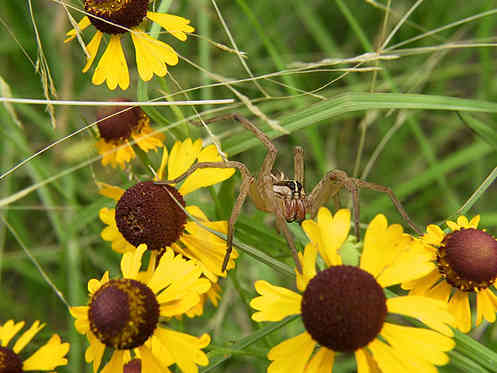 From Josh's picture galleries at nf0's Life comes this pleasant flower picture: arachnophobes should look away now! I find spiders fascinating creatures. We have Wolf Spiders here, which fortunately are harmless because occasionally one will crawl across my feet as I sit at the computer, and Black Widow Spiders, which I have yet to see. Josh has lots more subjects in his galleries, plus his weblog - well worth a look. Aficionados of trivia (which is just information for which the need is in the future) may enjoy Eric Shackle's page from Brookmans Park, between Hatfield (map) and Potters Bar in the English county of Hertfordshire just north of London, home of Dr. Thomas Muffet (or possibly Moufet, or even Moffat) who lived 1553-1604. He was an entomologist and wrote 'Theatre of Insects, the first scientific catalogue of British native species'. Eric's ebook web site is a mother lode of information that you may be needing any day soon. Steve Heliczer has a gallery of modern day residents of Brookmans Park.